We all know that exercise is good for us. Many Americans are participating in fitness routines in order to maintain a healthy lifestyle. All of this exercise can have both positive and negative impacts on our bodies. Athletes today often have sports related trauma and injuries. Oral fitness is no different. A healthy mouth is part of a healthy body. But did you know that some of the routines used to keep our body fit can have a negative impact on our teeth? A recent study of international athletes showed that high performing athletes had increased damage to their teeth. According to this new study individuals who train hard show changes in the chemical make up of their saliva. These changes may account for some of the increased decay and erosion of the athlete’s teeth. The more common findings are things we can adapt to every day. Sports Drinks – the Academy of General Dentistry has reported that the acid content of most sports drinks is so high, that damage to teeth occurs after using sports beverages for 5 consecutive days. This really makes me rethink the sports drink vending machines in the high school or the cases of sports beverage consumed during practice and games. The alternatives to this is water, or one of the waters with all of the minerals and electrolytes found in sports drinks. Coconut water is an amazing option as it no only rehydrates, it has anti-inflammatory properties as well. Open mouth breathing – we know that when we vigorously exercise we breathe heavily through the mouth. This causes the mouth to dry out, and without the saliva bathing the teeth, the oral bacteria thrive. This is a major factor of increased cavities and weakened dental enamel in athletes. What can we do? Drink plenty of water to stay hydrated. Maintain good oral hygiene in order to keep the normal bacteria count as low as possible. Consider adding additional fluoride to the daily routine. Fluoride strengthens the tooth enamel making it more resistant to erosion. Use a fluoride containing mouth rinse twice daily and avoid mouth rinses that contain alcohol. Ask your dentist if he or she feels more aggressive fluoride therapy would benefit you. Wear a mouthguard. We know about wearing a protective guard for contact sports. Most teams mandate mouth protection. It is important to know that all mouthguards are not created equal. A custom fabricated guard fits better, is less bulky and allows more air flow through the mouth than an off the shelf guard. A custom guard will not move around the mouth, it will stay put allowing for better communication on and off the field. Do you clench when you exercise? Some athletes who do not participate in classic contact sports damage their teeth by clenching. This hidden force can cause fractures or cracks in the teeth. Consider wearing a guard so that clenching does not cause damage. Strength training, weight lifting or even vigorous stretching can cause a clench. Many athletes support their joints with tape, braces or compression. Why not support your teeth with a guard? Swimmers must pay special attention, not all swimming pool water is created equally. If the swimming pool water is not managed properly, the pool water itself can dissolve dental enamel. This may show on the front teeth. Swimmers who train for an hour or so in a pool (or youngsters who play for hours in the water) may be causing damage to their teeth. A study showed that 26% of competitive swimmers and 10% of recreational swimmers showed damage related to pool water. New parameters are being developed to better manage minerals and pH in pool water. It’s not all doom and gloom. Regular exercise can help lower the risk of developing gum disease. One study showed that individuals who worked out regularly and did not smoke were more than 50% less likely to develop gum diseases. The numbers were similar in another study that compared BMI to gum disease. We know that gum disease is a contributing factor in cardiovascular and heart disease. The basic results say that people to who are active and maintain a healthy lifestyle or more likely to keep their teeth and live a healthier life. Keeping fit and healthy is important for entire body. Maintaining good nutrition, healthy hydration and physical protection from injury is an essential part of staying fit. Regular check-ups with your physician and your dentist are an essential part of any fitness program. 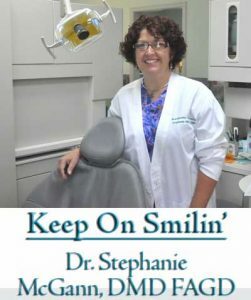 Dr. Stephanie McGann, who has more than two decades of dental practice experience, is a resident of the Unionville area and along with her partner, Dr. Marie Scott, practice at The Brandywine Smile Center, a family-friendly dental practice in Concordville. Dr. McGann also owns a practice in Valley Township, Rainbow Valley Dental. She is the current President of the Chester/Delaware Dental Society and she is a Fellow of the Academy of General Dentistry.